This week I am sharing another trash to treasure project, a little table I worked on that needed some rehab love. When I find something great in the rubbish, I get so excited to start the piece that I forget to take before pictures. I know, bad habit I need to break! 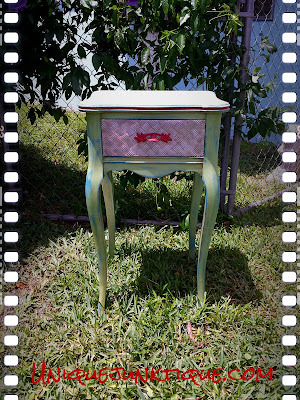 Dear Hubby brought home a little nightstand table one day in a sorry state. The drawer was so wedged in place that he actually ripped the front off in one huge tug trying to get it open, in disgust he left it there with the drawer still jammed inside.. Ahh men for ya .. No patience. But bless his heart for bringing this little lovely home to me, because it became the little table that could. Well in the process of trying to open the drawer, the face was split in half and the dovetail joints were torn up. On top of that the veneer was missing chunks, and the veneer on the little table top was starting to lift as well. 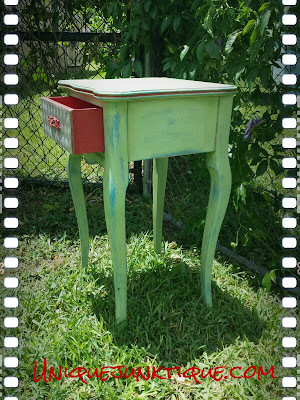 The legs had tiny screws and brackets where someone had previously attached a shelf, and it was painted that hideous dated factory yellow. So I proceeded to get to work, filled the holes in the legs, glued the lifting veneer on the top, then slowly but surely I managed to pull and wiggle, tug and coax, that little drawer – or what was left of it , right on out of there with a little muscle. The drawer was in need of serious repair. The veneer was removed, glued, clamped and filled the gaps in the dovetail with little scraps of veneer and wood filler. Then the sides needed sanding to solve the problem of the drawer sticking again. 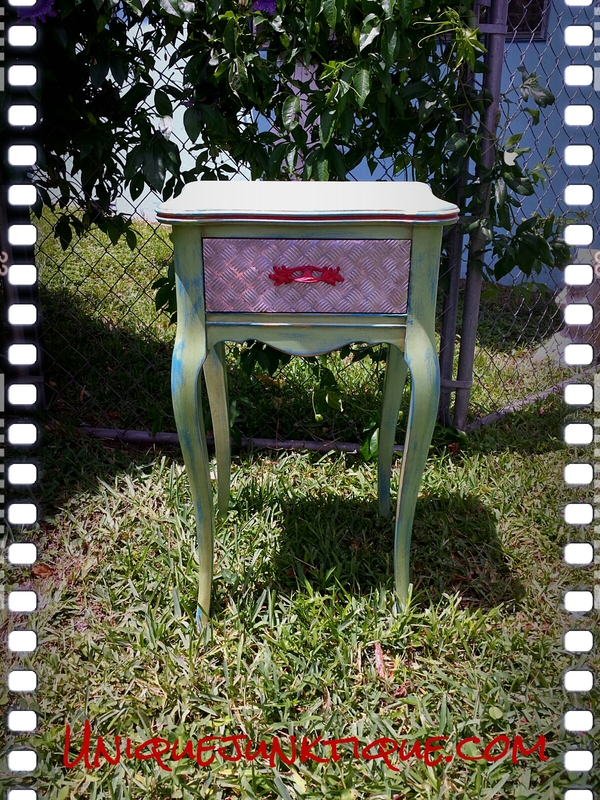 The drawer front needed to be replaced with something and this piece really called for visual interest to give it an unexpected pop, so I went with faux diamond plate, which was really super shiny so it was aged up with acrylic paint and antiquing glaze. 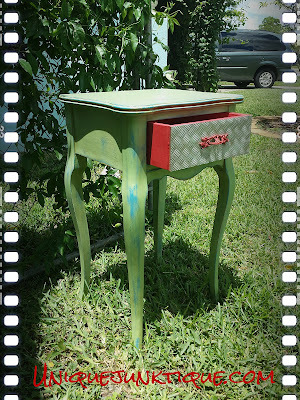 The paints used were Cece Caldwell’s chalk paints in Montana Blue, topped with Kentucky Mint. Accented it with a pop of Traverse City Cherry. I prefer the Annie Sloan line of wax , so I rubbed it down and voila all done. 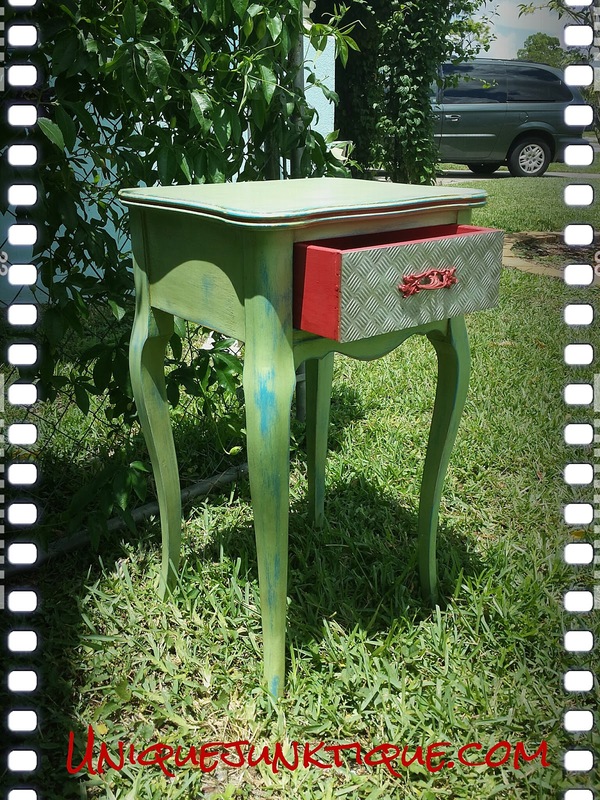 So may I Introduce – The Little Table That Could….. Could have gone to the dump that is, but instead found its way into our cozy little house! And this New furniture Party! 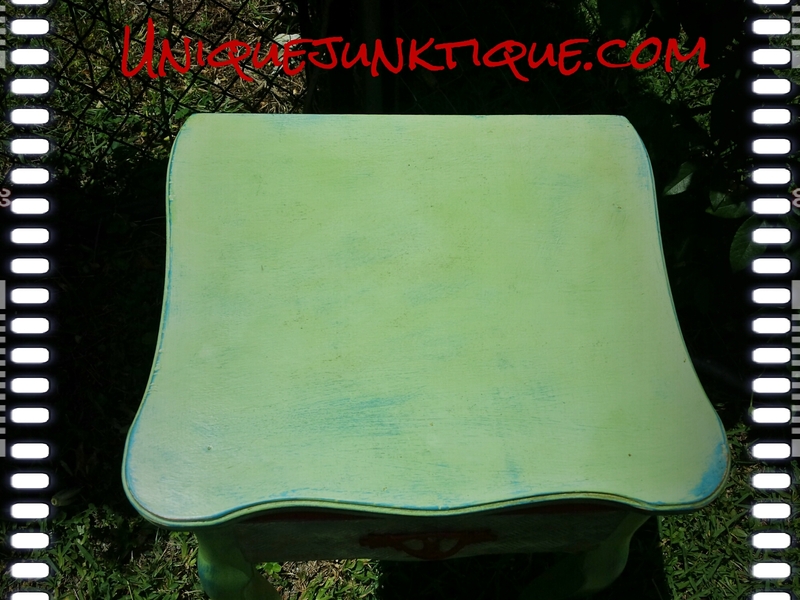 PreviousThis Salvaged Table Got A Facelift!